Remains of a door sit atop of rubble. 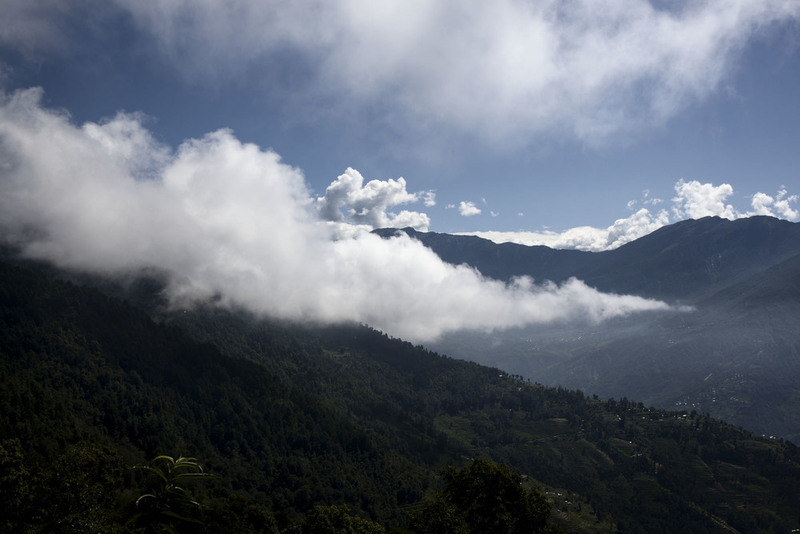 Outside of Duwachaur village, Sindupalchowk district, Nepal. July 27, 2015. Setu Giri age 55, “Two years ago I broke my leg, and got a plate put in and have had problems since then. When earthquake came I damaged the plate again when I was trying to run now I am like this. Kadambas Village ward No. 6 Sindupalchowk District, Nepal. August 3, 2015. Hima Devp Magar age 46 “I was Feeling like we can not live in this area, everywhere landslide, everywhere was totally damaged. After 5 or 6 days we started feeling normal, but at the time I thought how can we live here”. Kandambas Village Ward No. 5 Sindupalcowk District, Nepal. July 30, 2015. Overview Tauthali Village, Sindupalchowk District, Nepal. August 4, 2015. Sangachok Village, Sindupalchowk District, Nepal. July 31, 2015. Hima Devp Magar age 46 prepares to make breakfast in her temporary shelter. Kandambas Village Ward No. 5 Sindupalcowk District, Nepal. July 30, 2015. Remains of a secondary school. Sindupalchowk District, Nepal. July 31, 2015. 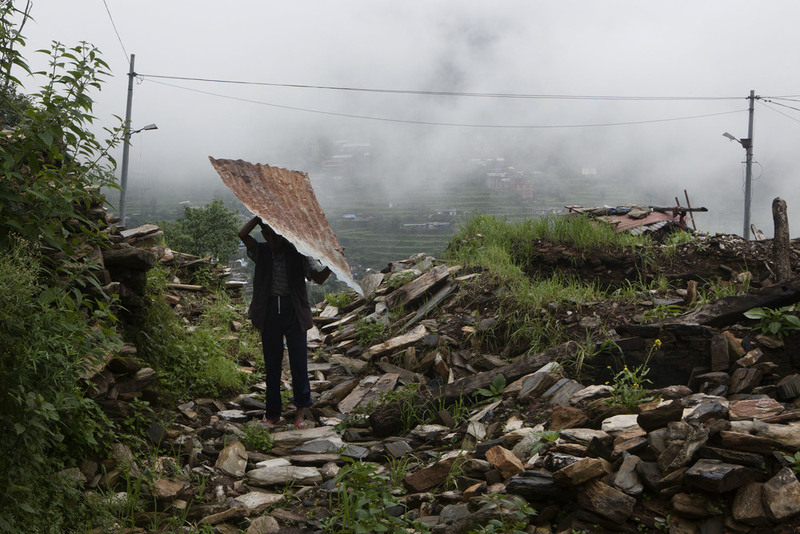 Prembahadur Shrestha age 65, works to clear rubble from his home. Tauthali Village ward No.3 Sindupalchowk District, Nepal. August 5, 2015. 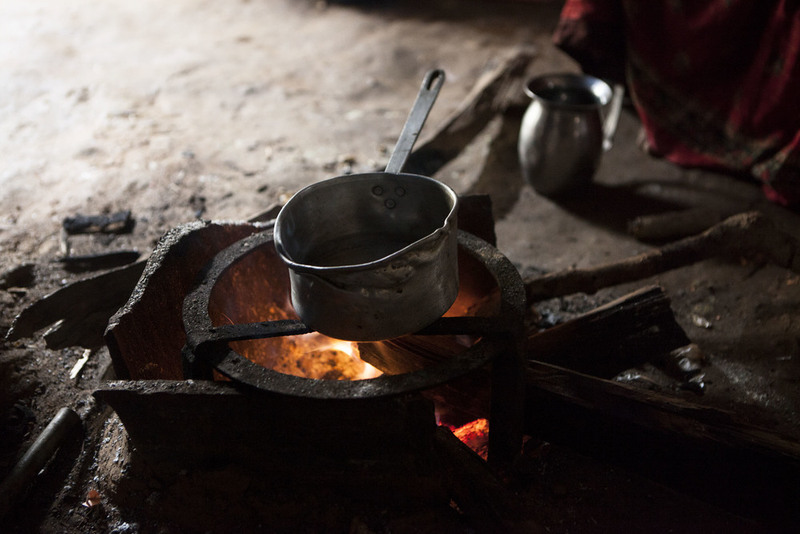 Surjakumari Sherstha age 60 prepares to make tea inside of her temporary shelter. Tauthali Village ward No. 3, Sindupalchowk District, Nepal. August 6, 2015. Kids leave school in the Kadamnas Village ward no. 4. Private and government schools have now reopened. Sindupalchowk District, Nepal. August 3, 2015. Chinimaya Tamang age 40 “When I saw my home everything was totally collapsed. Just now things are becoming all right, now we are getting relief for food, but still big problem is drinking water”. Kadambas Village ward No. 3 Sindupalchowk Disrict, Nepal. August 3, 2015. A Villager stands amongst rubble. Tauthali Village, Sindupalchowk District, Nepal. August 5, 2015. Prembahadur Shrestha age 65 stands where his home once was. “When I came here to see my home, I couldn’t see, I just cried. Now I am not feeling so good just thinking how can I rebuild how to live again.” Tauthali Village, Sindupalchowk District, Nepal. August 5, 2015. Kids of the Kaalidevi higher school attend class inside of a temporary school made of bamboo. Private and government schools have now reopened. Kadamnas Village ward no. 4. Sindupalchowk District, Nepal. August 3, 2015. A collapsed building Sindupalchowk district, Nepal. August 2, 2015. 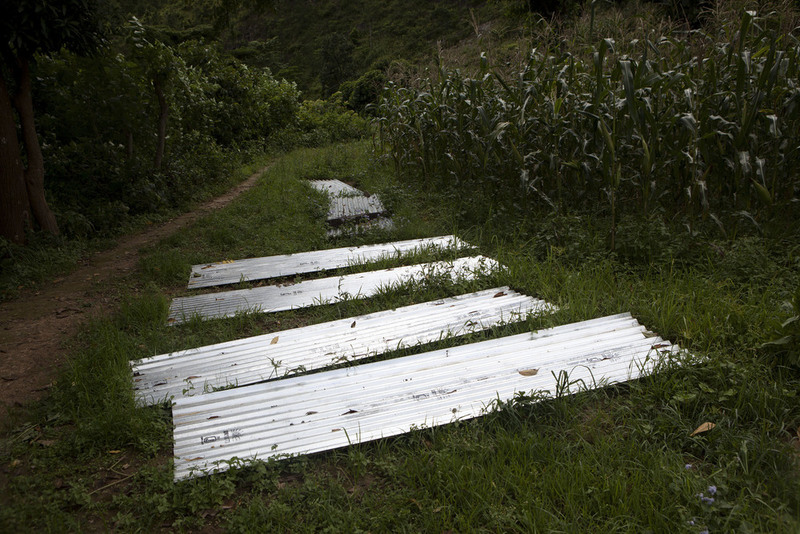 Tin is laid out beside a footpath to be used for a shelter. Kadamnas Village, Sindupalchowk District, Nepal. August 1, 2015. 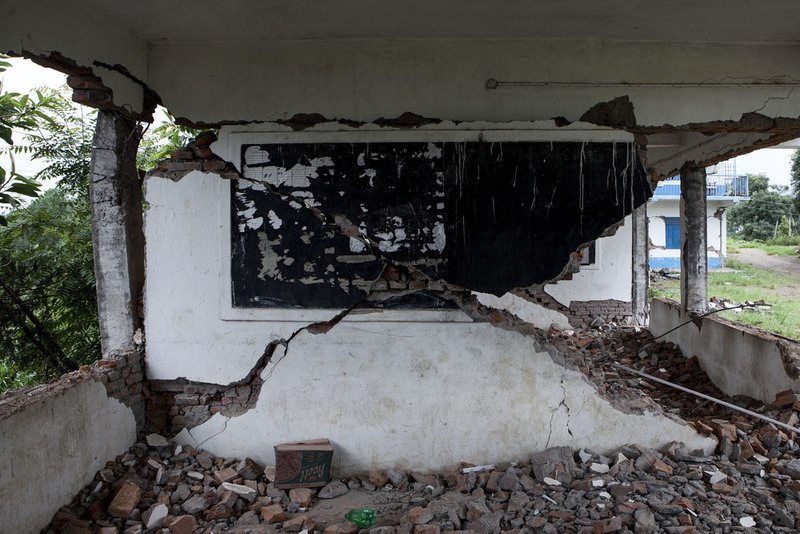 A few days after the April 25th 7.8 magnitude earthquake struck Nepal, it was becoming clear the extent of the damage was far worse outside the capital of Kathmandu. Remote villages had been reported flattened and rural districts had no aid, no help. The Sindupalchowk district is home to about 350,000 people housed in approximately 66,000 homes. The earthquake damaged or completely destroyed 90% of the homes. An estimated 3,438 people lost their lives in this district alone.